Considering This Question Could Change Your Marriage–What Identifies You? 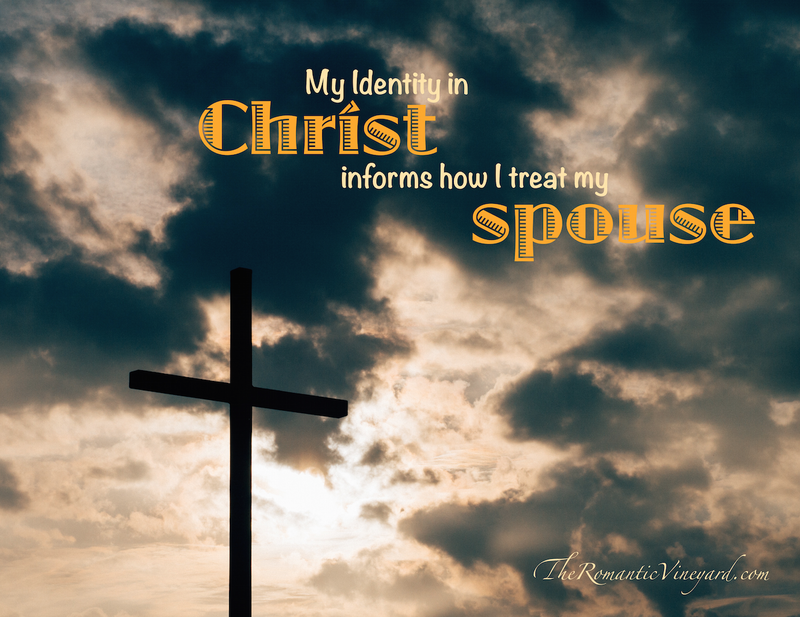 I’ve been thinking about my identity in Christ and how it informs the way I treat my husband. When I have my focus upward and not inward I tend to see difficulties and conflict in a way that places God’s glory first and my preferences second. When I have my focus on myself and what I think I deserve then all kinds of dissensions arise. “A large part of the biblical story is about identity. It reveals the wrong reactions that come when we forget who we are, as well as the godly responses that come with remembering. Adam and Eve listened to the serpent, bought into his lies, and ate the forbidden fruit because they forgot their true identity. They were God’s creatures, intended to live within the boundaries God had designed for them. As you can see when we choose to listen to the voices that tell us we deserve better, that we shouldn’t have to serve or lay down our lives for our spouse, that we should have never married in the first place, we are forgetting this important fact and missing the one thing necessary to take our marriage to a lasting place of safety and trust. Christ laid His life down for us when we were at our worst. When He asks us to do the same in our marriage, He doesn’t leave us to ourselves to do it. He is the Good Shepherd who has promised to walk with us through the valleys, through the difficulty, and give us His love, His compassion to love our spouse beyond our natural ability to do so. This circumvents our past experiences and helps us rise above our emotions. It takes us to a deeper level of love and care. When we live out of a sense of who we are in Christ, we live our lives based on all we have been given by Christ. This keeps us from seeking to get those things from the people and situations around us…In almost thirty years of counseling, I have talked with countless women in difficult marriages who said, ‘All I ever wanted was for my husband to make me happy.’ My first thought is invariably, Well, then, he’s cooked! No human being was ever meant to be the source of personal joy and contentment for someone else. And surely, no sinner is ever going to be able to pull that off day after day in the all-encompassing relationship of marriage! Your spouse, your friends, and your children cannot be the sources of your identity. When you seek to define who you are through those relationships, you are actually asking another sinner to be your personal messiah, to give you the inward rest of soul that only God can give. If you’ve been doing this to your spouse, you most likely are not satisfied with the way they are right now. I can only love my husband earnestly because I’m aware daily of the love Christ has for me and for him. Tom is God’s son, and my brother in Christ, and we serve and love Him together. Knowing this helps inform my disappointments when he doesn’t do something I want or act in a way I had hoped. I’m not dependent on Tom for my joy or happiness–although God allows him to be a big part of what brings me joy and happiness in this life. How about you? Are you expecting too much from your spouse? Are you currently disappointed or tempted to believe you missed God’s will? I encourage you to do an identity check in your own heart. It may be the problem is vertical, and not horizontal. Considering this question could change your #marriage–What identifies you? When I have my focus on myself and what I think I deserve then all kinds of dissensions arise. When I have my focus upward and not inward I tend to see difficulties in a way that places God’s glory first and my preferences second. Christ laid His life down for us at our worst. When He asks us to do the same in our #marriage, He doesn’t leave us to ourselves to do it. This entry was posted in Christian Marriage and tagged Disappointment in Marriage, I married the wrong person, Identity in Christ, What identifies you?. Bookmark the permalink.